It appears that the Toshiba Thrive is coming to Europe as the AT 100. The Toshiba Thrive has been available in the United States for two months. You can check it out on Toshiba Europe’s products website for yourself. 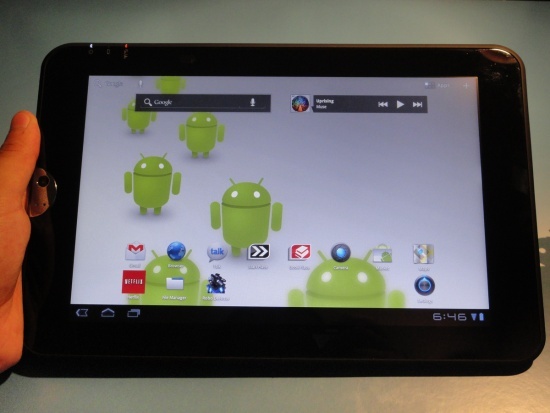 According to Toshiba’s website it will run on the Android 3.1 operating system. The AT 100 features a NVIDIA Tegra 250 dual-core Processor and has 1.0 GHz. So far it is only available in the 16 GB model but will include a 5.0 MP camera. With it you will get a full-functional USB-port, an SD card and MMC reader. Additionally it features front and rear cameras and is downright clunky. Toshiba advertises in the specs that it will have a seven hour battery life. We will have to wait to check that out for ourselves.